MouseStats provides in-depth Form Analytics to many companies and startups around the world. By setting up this service within minutes, you would be able to monitor and review your website form performance over time. The reports are absolutely comprehensive and include critical measures up to the fields level. The overall form performance and conversion rate will be monitored. Therefore, you would be able to compare the conversions, engagments and time measures based on updates. Moreover, according to the expanded reports for each field, improving user experience would be simple. This reports are presented in the best way possible, and simply exportable. 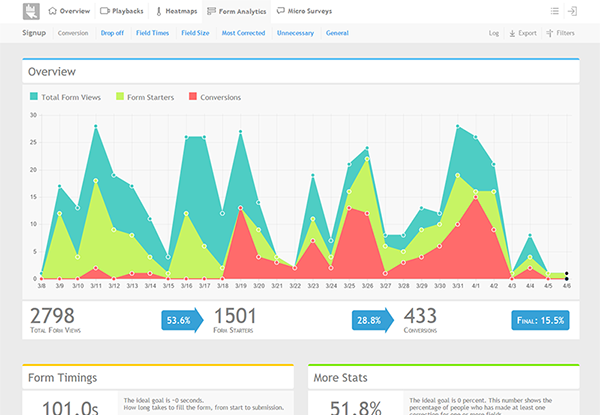 Visualized report helps you to detect fields those are causing problem for visitors. Losing even a single visitor in the form page is not acceptable as a visitor who has came to signup/billing/payment form is a high potential customer. Avoid losing customers because of some easy to solve, but important updates in your form by monitoring your form performance using Form Analytics. With the new version of MouseStats Form Analytics, an overall form attributes report over time has been unlocked for all users. A detailed chart will illustrate the Form Views > Form Starters > Conversions in a simple-to-understand format. Over time, it is possible to track improvements and keep the log of the past measures for a comparision. Much more updates have been applied to all sections and new features are now available regarding field measures. From now, charts and expanded reports help you to understand result at a glance without any confusion. If there is any question please share with us (hello@mousestats.com) as we would love to discuss about MouseStats.